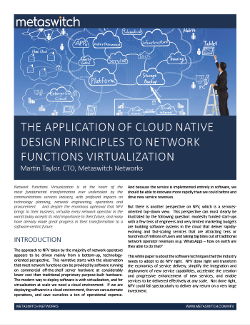 Network Functions Virtualization is at the heart of the most fundamental transformation ever undertaken by the communications services industry, with profound impacts on technology planning, network engineering, operations and procurement. And despite the enormous upheaval that NFV brings to their business, virtually every network operator in the world today accepts its vital importance to their future, and many have already made great progress in their transformation to a software-centric future. The approach to NFV taken by the majority of network operators appears to be driven mainly from a bottom-up, technology-oriented perspective. This narrative starts with the observation that most network functions can be provided by software running on commercial off-the-shelf server hardware at considerably lower cost than traditional proprietary purpose-built hardware. The modern way to deploy software is with virtualization, and for virtualization at scale we need a cloud environment. If we are deploying software in a cloud environment, then we can automate operations, and save ourselves a ton of operational expense.